In our home the best way to enjoy breakfast is to have it for dinner. Your taste buds are awake…all your senses are kicking…you are actually really hungry!! 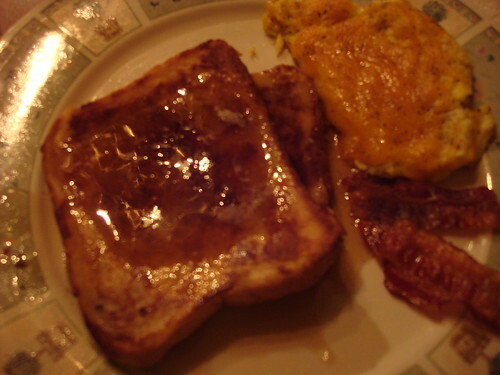 This is where French Toast comes into play and this awesome recipe won’t disappoint. Mix the eggs, milk, flour, sugar,vanilla, salt and cinnamon together. Heat skillet adding butter when hot. Drop bread in batter for 30 seconds on each side. Add some scrambled eggs and bacon and there you have it…breakfast for dinner.